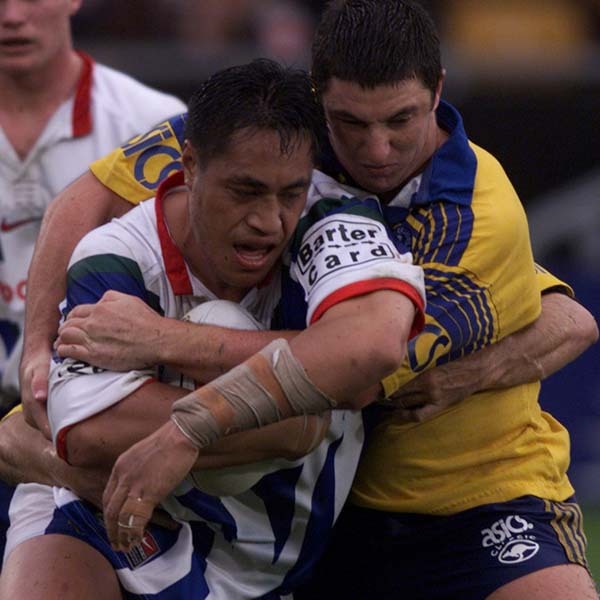 Highly regarded as one of the best props in the business during his playing days, Joe is a veteran of 115 games for the Auckland Warriors between 1995-2000, 239 with the Bradford Bulls between 2001-2008 as well as making 2 Test appearances for Samoa in 1995 and 27 for New Zealand between 1996-2006.
areer tries, Joe managed to avoid the dreaded "nudie run" throughout his entire career. 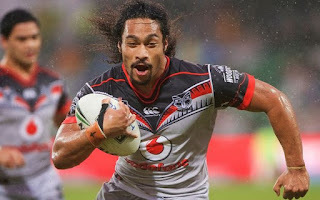 In a recent poll that was conducted with the NZ Warriors Faithers, Joe was voted into the "Faithers Best Ever 17", an honor that must be up with the best of them. These days, away from the footy field, Joe keeps himself busy with his youth mentoring trust, targeting Maori and Pacific Islander youth, a machine leasing company where he leases out trucks, diggers etc and has a family including his beautiful wife Andria and their 4 kids. Today the NZ Warriors Faithers have been lucky enough to be blessed with some of Big Joe's free time and has given us the opportunity to learn a little more about one of the Warriors originals. Joe: Grey Lynn park central Auckland. A club called Richmond Rovers which happens to be the local club that’s produced the most kiwis from. Faithers: Do you still have an involvement with Rugby League? Joe: No , but i do keep up with the gossip and support current crop outside of the pitch if required. Faithers: You come from a family that has some seriously talented sporting ability with not only yourself, but also your cousin Nigel and Linda. What's the secret to the families sporting success? Joe: Family!! Great support for us all and kept us grounded when we could’ve got our heads get too big …. Nothing like playing in front of thousands , people cheering your name then to come home and be told to take the rubbish out, do the dishes, vaccum the house, tidy your room. Brings us young sports stars back to ground level!! 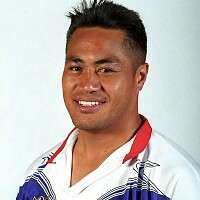 Joe: Well names like Stacey Jones and Ruben Wiki and my cousin Nigel spring to mind but I cant go past Quentin Pongia. He was a tough no nonsense player who trained like he played and never took a backward step, a very scary guy … and we were on the same team lol!! Faithers: Is there a player you wished you could have played alongside but never got the chance? Joe: Yep! My idol growing up, the great Mark Graham!! Man he was just AWESOME had the pleasure to be coached by him with the warriors, 1st thing I did when I met him was ask for his autograph!! Faithers: What do you think of the current Warriors young/local front rowers, Vete, Lisone, Sipley and Bunty? Joe: Great Potential and very exciting, especially Bunty. Faithers: If you could pick any two props from the NRL or ESL to come into the warriors. Who would they be and why? Faithers: You'll always be remembered as one of the great props to play the game yet when people talk about you it's common for them to refer to you as humble, a modest sports star and a man who has his head out of the clouds. What's the secret to not letting the accolades take over your ego and instead keep your feet firmly on the ground? Joe: Touched on it before, my family and close friends kept me grounded and I was getting paid to do do something I loved doing, understanding the responsibilities of being a role model to our young men I took seriously. Faithers: How disappointed were you that you missed out on being on the original Warriors teams due to injury? Faithers: Are words able to describe that moment you first ran onto Mt Smart Stadium in Warriors colors in front of family, friends and thousands of adoring fans? Joe: So many feelings from feeling numb, nervous, proud, excited. I couldn’t hear myself it was sooooooooooo awesome. Faithers: An error from staff resulted in the Warriors using you as an extra interchange, costing us competition points and inevitably a spot in our first finals appearance. How did that come about and who blew the whistle on the incident? Joe: lol yeah I still get stick from the guys now, but I blame the coaching staff as I wasn’t counting the changes, my job was to play. Faithers: Are you still upset at how the club and media portrayed you during the Eric Watson contract renegotiations? Faithers: You tasted a lot of success at Bradford Bulls. What was your best memory of the club? Joe: Oh great times. So many memories but the key was it was a family club. Many finals won but one in particular was with arch rivals Leeds Rhinos played at Millennium Stadium in Wales in front of 70 – 80 thousand singing/ chanting fans. Faithers: After a poor start to the 2003 season the media and clubs board were beginning to hit the panic button. Noble singled out the forwards in particular for not being up to speed. In his book "Build Winning Teams", Noble recalls you walking past, giving him a wink and saying "Don't worry boss, we'll sort it out". What was the major contributing factor that allowed the team to turn things around so quickly and what do you believe the reason was to getting off to a sluggish start to begin the season? Joe: Yep that came down to belief and we believed in ourselves and as a group we stuck to our game plan, trained harder, didn’t listen to the negative comments in the media and from our knockers. Faithers: In 2003, Brad Noble is quoted as saying "all year (at training) we had bashed them physically" and as a result a bet was made with senior players that should the team finish top 2 then the coaching staff would complete a gruelling skills conditioning session that would be set by the players. From my understanding Noble had forgotten about this bet and the thing that triggered his memory was walking into the changing rooms to see yourself and 3 others players with smiles from ear to ear, dressed in the coaches uniforms with the whistles to match. On a scale of 1-Amazing, how good was it to dish out a bit of punishment to those who had inflicted it on the players all season? And how did the coaches cope with the session set by the players? Joe: Haha yeah was fun and the coaching staff kept their word and let us punish them …. All in good nature … most of it !! Faithers: Bradford vs Hull, August 26 2008. You get a shot at conversion and strike it beautifully only to miss due to a breeze coming from nowhere pushing it wide of the sticks. Were you 0/1 for the career or was there other sneaky conversions that i didn't know about? Joe: It wasn’t a breeze! I'm sure it was like a cyclone and I just missed from the sideline hahaha. I did actually convert one against Featherstone in a challenge cup game, again from the sideline for the record!!! Faithers: You were named in Bradfords team of the century. Where does that stand alongside your long list of achievements in Rugby League? Joe: Oh i've been blessed and this one is up there for sure. To be singled out and voted by the fans out of 100 years is very special. I must've of done something right. Faithers: What were the notable differences between your time at the Warriors and Bulls? Joe: No pressure in terms of one team, one country that the warriors are in week in and week out. Faithers: When you think back over your playing career, what is the one moment that more often than not pops into your mind first? Faithers : Trading Cards were a big deal in the 90's. I've still got a 1995 Joe Vagana NZRL Card #69 stored away safely at my parents. Are pieces of memorabilia like that something you've held onto over the years? Faithers: Playing prop is one of the most demanding positions in the game. They say no matter how good the team is, if the engine isn't running then the Porsche just sits there. How is the body holding up after years of being part of the engine for the teams you played with? Joe: True statement!! lol yep body has taken its fair few knocks and scars remain, dislocated fingers, bad knees / joints etc but not bad as we did play in an era where physios, massages, stretching, yoga and rehab was part of. Faithers: I recall reading an interview with you in the past where your answer to "what is the favourite past time you guys share" was "cuddling and pashing with your wife Andria". Is that still up there at #1? Faithers: You're moving to a deserted island and can only take 3 things. What do you take? Joe: All sorts from acdc, M Jackson to adele. Just depends on the mood. Faithers: If you could be any animal in the world, what would you be and why? Joe: I was so good they asked me to repeat a couple of years ! Faithers: Who wins the fight, Superman or Batman? Faithers: A penguin knocks on your door wearing a sombrero, what does he say and why is he here? Faithers: Finally, what does the future have in store for Joe Vagana? Joe: Bills, work, wife yelling at me, kids spending my money, watching Warriors win 2017 NRL and plenty of Love and Laughter.